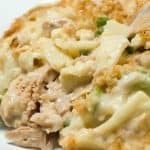 Tuna noodle casserole was rarely, if ever, on the menu in my house growing up. My mom wasn’t a big tunafish fan. Instead, I looked forward to it showing up for lunch in the school cafeteria and later in the hospital cafeteria, where I first worked after graduating from college. Eventually I began making it for myself, trying out a wide range of variations, before finally settling on the classic Campbell’s Tuna Noodle Casserole recipe. I love recipes for casseroles because of their make-now, bake-later versatility. You can mix it together when you have a few minutes to spare, place it in the fridge, and just pop it into a preheated oven at dinner time. While the casserole bakes you can prepare a quick salad, enjoy a glass of wine, or sneak in a few minutes of exercise. I used Campbell’s Healthy Request Cream of Mushroom soup, which is lighter in fat, salt and calories. And I substituted Ronzoni garden delight tricolor penne pasta for noodles. To bulk it up further, you could always add more veggies, like defrosted chopped roasted broccoli or sliced mushrooms. I also skipped mixing the bread crumbs with melted butter to shave away one SmartPoint. Served with a simple green salad and/or roasted carrots, it makes for a satisfying dinner. 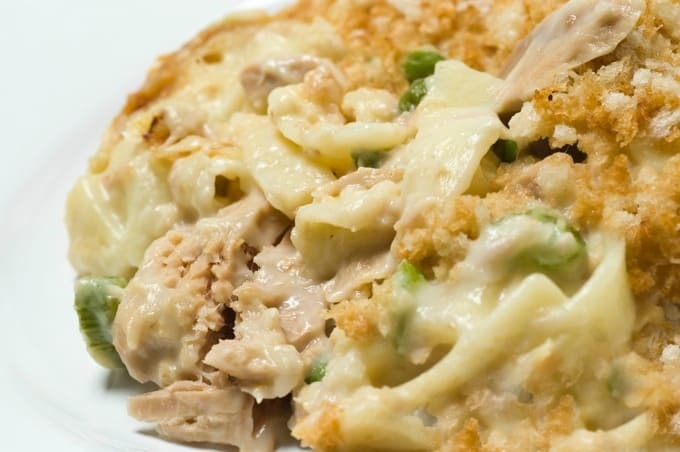 A classic from childhood made Weight Watchers friendly, this tuna noodle casserole is always a crowd pleaser. Preheat oven to 400°F. Lightly grease a 1 1/2 quart baking dish with nonstick cooking spray. In a large bowl, mix the soup, milk, peas, pimiento (if using), tuna, and noodles until well combined. Scrape mixture into your prepared casserole dish. Sprinkle breadcrumbs on top of casserole and lightly spritz with cooking spray. Bake for 20 to 25 minutes, or until heated through and lightly browned on top. Martha, are the noodles measured before cooking or after cooking? If I understand correctly it appears to me that you cook noodles, then measure out 2 cups. Am I missing the serving size ?? I suppose I should be able to figure it out, but nope, I can’t LOL……..Thanks for your help…. Hi Debbie, I’ve never actually measured it out! I just divide the casserole in 4 in my mind’s eye and then scoop out that amount as one serving. The next time I make it I’ll try to remember to measure it more accurately.